So, another Record Store Day. The international event that--in theory--celebrates the music and hobby I love. I can't help feel conflicted about it though, because while it does achieve its primary goal--getting people to shop at independent record stores--it is clearly flawed and has some upsetting outcomes. Is it more good or bad? Is it worth it? As you can see from my Instagram post yesterday, I went, and got what I wanted, the new Record Store Day Exclusive Thrice EP. Keeping this very simple: the EP is excellent and it is four new songs from one of my favorite bands. I posed some questions in that post though that I will now explore in depth. I'll start with my personal experience; I went to Village Vinyl in Warren, Michigan--a suburb of Detroit. This was my second Detroit Record Store Day, but last year I went in the afternoon and was not in search of exclusives. This time around I was seeking to avoid the lines and chaos of the more popular downtown Detroit stores, and I picked Village Vinyl because they replied the quickest and the most thoroughly to my questions about what they might carry. Despite every attempt from Village Vinyl to give a great experience, it was not (at least not for me). Some of this was their own fault, but much of it had nothing to do with the store itself. However, I will never visit Village Vinyl on Record Store Day again because of one huge problem that is not necessarily their fault: the incredibly small size of their store. So small they only let 15 or so people shop inside at a time. I arrived at 7:55 a.m. for an 8:00 a.m. opening. I had no problems knowing there would be people who had lined up before me that would gain first access to the hundreds of Record Store Day exclusive releases I was uninterested in. However, I assumed incorrectly I would personally get in the door before 8:15 a.m. I also assumed incorrectly I would be able to browse their store, which is my favorite part of visiting record stores. I had a personal budget of $30 for the day, about half of which I planned to spend on the the the Thrice EP. With the other half of my budget I hoped to get some fun used records (which take time to find). Well, by 8:15, I had not moved in line. There was a quick rush in at 8:00 in which they let some people in, but for the next hour, they only let 2-3 people in every 5 minutes. I really couldn't figure out what was going on until I heard chatter about how small the store was; turns out it was about the size of my bedroom. I finally gained entry to the store at 9:05 or so. At that point I hoped to spend 30 minutes in the store, grabbing a copy of the Thrice EP I hoped was left, and then browsing the racks. However, within seconds of being allowed entry in to the store, I discovered the problem. The methodical line continued into the store and was set up so that everyone had to browse and follow the alphabetical Record Store Day exclusive crates. I could see the crate I wanted to access, the one that started with the "S" releases, and I asked an employee if I could cross the store to it and attempt to snag the Thrice EP. However, he told me "no", that I would have to wait in line, and was free to browse the non-exclusive inventory they had. Well, that was pretty much impossible because the only crates within my reach were genres I had no interest in. So here I was, in the store, and unable to shop, because most of the people ahead of me were browsing through EVERY SINGLE RSD EXCLUSIVE. This led to an interesting observation: most of the people there ahead of me had significantly larger budgets than me. The demographic was diverse, men and women ages 15 to 70. But what they had in common is that most of them purchased at least 10 if not 20 albums. During the hour I waited to go in the store, I watched person after person exit the store with at least one if not multiple bags and large stacks of records. I wasn't jealous (well, maybe a little jealous) but I did have questions. One question I kept thinking was, "I wonder how many copies of the Thrice EP there were and I wonder if there are any left?" But the final question I had, and that I'll conclude this post with, is "how many of those records are they going to sell online?" After 15 minutes in the store, and having only moved up 3-4 spots in line, I finally called up to someone near that crate that began with "S" and asked them if they wouldn't mind seeing if the Thrice EP was there. Thankfully they found it and passed it back to me. And then I practically had to ask permission to check out, because by me paying and leaving I was circumventing the system they had in place. By this point I had no energy or desire to try to seek out interesting used records. Plus, there were people on the sidewalk still waiting to get in, and if I were to browse, it meant they had to wait longer. Thankfully I got out and got home with 15 minutes to spare before my daughter's soccer game. Sadly, the shopping experience was totally lost. There was no opportunity to browse, and no opportunity to move around the store. How many people in front of me in line could have come and go so much quicker had they not been sent into a line and system that required either browsing all the exclusives, or at least waiting for the people ahead of you to browse them? This was so unlike any Record Store Day experience I have had before. Lines outside of stores? Of course? But inside? Never again. 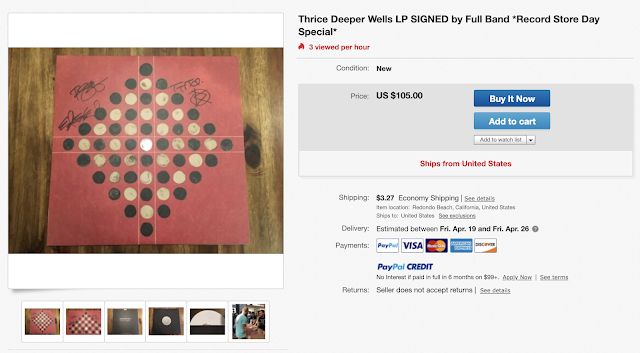 Centered around this entire experience was my plan and desire to buy the Thrice "Deeper Wells" EP. I am a huge Thrice fan, and my Thrice vinyl collection is important to me. Buying a one-sided LP with four new songs and an etching was appealing and exciting. I would have preferred to preorder it online, but thankfully I had the time and opportunity to go to a store (unlike many fans). But the main reason I went to the store was because I feared if I didn't go to try to buy the EP there would be two possible outcomes: either I wouldn't get the EP or I would have to pay an obscene price for it. 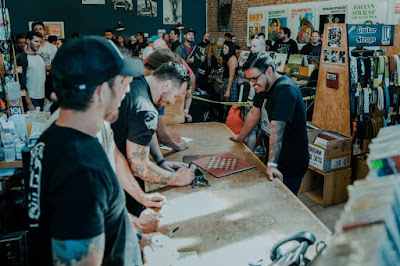 Not really much to say about that, except a whole lot of people that bought the Thrice EP Saturday weren't Thrice fans. 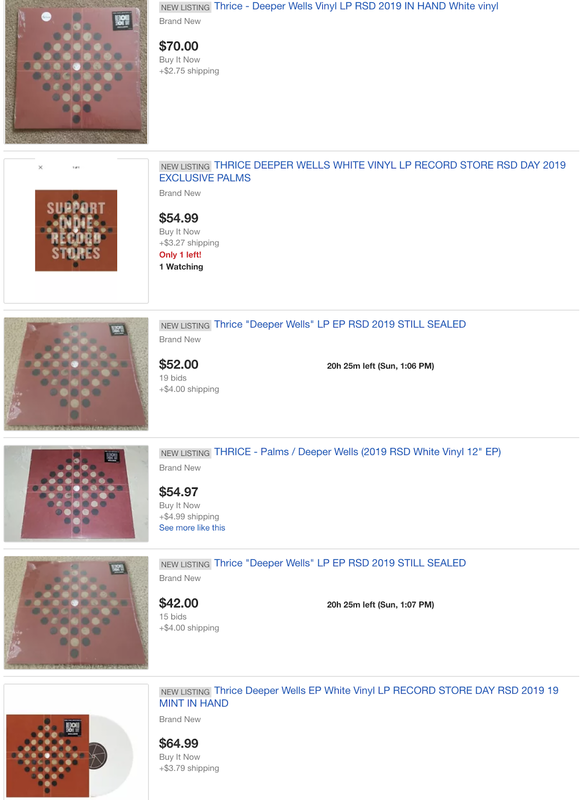 And a whole lot of Thrice fans who couldn't go to Record Store Day have a difficult decision to make. I am not sure if 4000 copies truly makes it "rare"; so maybe/hopefully the online resale price will drop radically this week. Hopefully it doesn't sell, but that doesn't excuse the listing. Should I envy this person for taking advantage of a flawed system and turning into a business opportunity? Or should I get upset because this is unethical (is it?)? If one does research and waits in line (at maybe more than one store), do they have the right to sell for whatever they want? Is pricing $15 albums for $75 the same day that you buy them wrong? 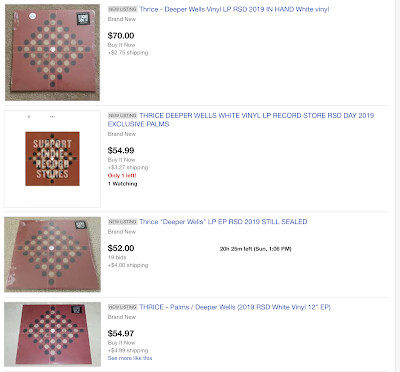 Is the the buyer's responsibility not to overpay for an album? Or is the the seller's responsibility to price items fairly? Have I ever sold an album for more than I bought it for? Yes, but only after the album(s) had aged a few years. For example, I bought Fiona Apple's most recent album new in 2012 for $20, and then sold it in 2018 for $120. Is my situation the same or different than Record Store Day flips? For Village Vinyl, probably not much. Larger store would help, but otherwise they might be stuck. Letting people exit line once inside the store would be nice, or maybe pull some product outside onto the sidewalk if it is a nice day. But for the industry? There needs to be change. Back to my original questions from my Instagram post: Is this good for musicians? I would assume so; for Thrice specifically there is obviously a lot of excitement surrounding new tunes. 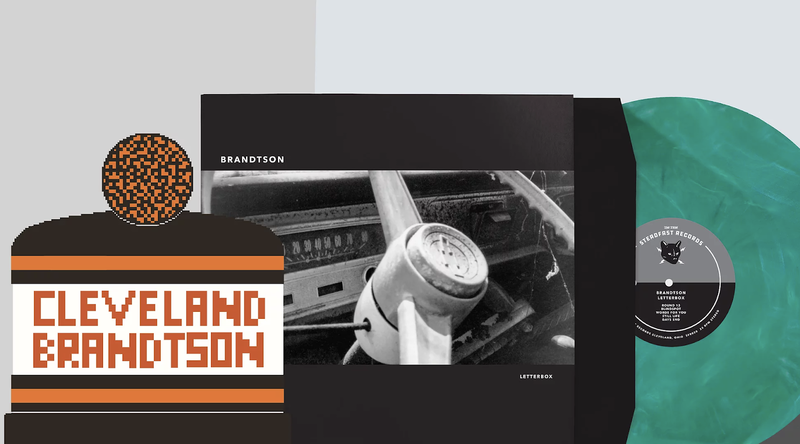 However, I do know some indie bands suffer trying to get their albums pressed because the vinyl pressing plants are all clogged up cranking out all these Record Store Day exclusives, many of which are crap. Is this good for stores? That is hard to say. I might reach out to a good friend who works for one to get some data. It brings people into their stores, but how much profit are they really making on that day? They have to purchase all these exclusive releases (some of which sell out, but many of which stay on shelves for years and eventually hit discount bins), and pay tons of staff to work to manage the crowds. My assumption is that it only benefits stores if people who come in on Record Store Day return and shop on random days for the rest of the year. 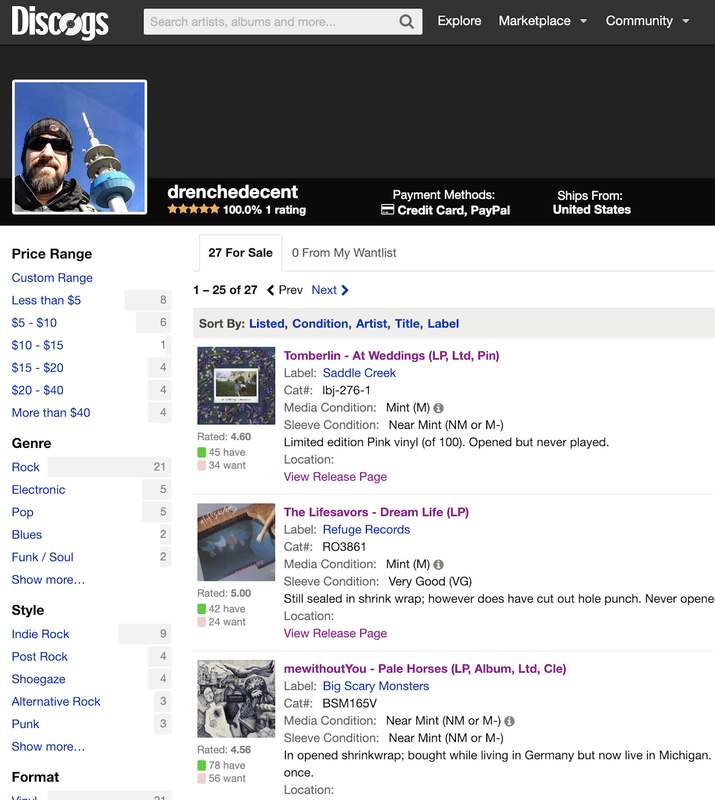 Nothing is going to prevent people from selling records and whatever else on eBay for inflated prices. But could a site like Discogs take a stand and not allow Record Store Day purchases the first weekend? Most of these releases, which seem rare if you couldn't get to a store, were actually pressed in incredibly large numbers. So if you give stores and online retailers time, they will begin to get listed at reasonable prices. For example, the Thrice EP can now thankfully be found on Discogs and other sites for $20.00 or so. Hopefully you had a good Record Store Day experience; and if so, I'd love to hear about it!